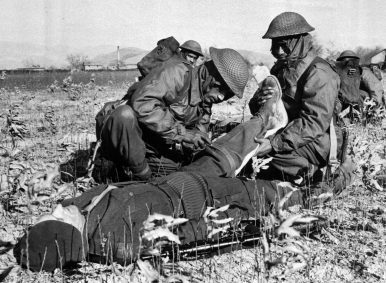 Troops from India set the leg of a simulated casualty during training somewhere in South Korea (Jan.19, 1951). In the middle of October this year, Indian newspapers reported that India and South Korea had come to an understanding regarding the building of a Korean War Memorial in central Delhi. The South Korean ambassador to India, Shin Bong-kil, told media that a site had already been identified by the “city government” and that his country was willing to contribute toward the construction of the memorial. The hope is that the memorial would be completed by the end of 2019. It is not often that one finds South Korea, or for that matter the Korean Peninsula, mentioned much in the Indian press in direct relation to India or Indian foreign policy. While there has been much coverage of the Koreas as regards the hot-and-cold relations between the United States, South Korea, and North Korea (as well as China), not to mention the highly discomfiting saber rattling involving nuclear weapons in recent times, Indians have followed the reporting much like spectators in a gladiatorial arena. The construction of the proposed memorial would serve as a reminder that there was a time when India had a much closer engagement with the politics of the Korean Peninsula. India, for more than three years, seemed to be among the gladiators as they sought to bring each other down. Why was India among the belligerents during the Korean War (1950-53)? What business did a newly independent India have getting embroiled in the great power politics of the times? What is clear is that New Delhi was at least partly motivated by the realization that the Cold War could take a very dangerous dimension in Asia, which could reach India’s vicinities, which led the government to take a great deal of interest in the war. Given the unveiling of nuclear weapons and their extremely destructive potential alongside the creation of an ominous bipolar structure, it seemed to Indian decision makers that India had to play a constructive role in the Korean War, especially since it commanded respect and influence among many in the international community. The aim was to prevent further conflagration in the peninsula. At the tangible, material level, India sent a medical unit, the 60th Para Field Ambulance, to render assistance to those injured in the war. The unit consisted of 346 personnel and served in the Korean theater for three and a half years. It provided assistance to 200,000 wounded and carried out 2,300 field surgeries. Later, as fighting was subsiding in 1953, India sent 6,000 soldiers to form the Custodian Force India (CFI), which was tasked with looking after prisoners of war (POWs) and resolving the issue of their repatriation. In addition to contributing personnel, India played an important role in seeking to resolve the war at a political and diplomatic level. Two basic imperatives guided India’s stand on the war. The first pertained to containing the war and not allowing it to escalate. There were many events that served as catalysts for escalation, such as the crossing of the 38th parallel by the North Korean forces, the appointment of General Douglas MacArthur — who had a reputation for being an aggressive commander with a penchant to take the fight to the enemy camp — as commander-in-chief of the UN forces, the crossing of the 38th parallel by the UN forces in October 1950 despite warnings by the Chinese, the crossing of the Yalu river by Chinese forces in November that year, and their subsequent crossing the 38th parallel in December 1950. India strove to prevent any of these dangerous developments from providing an excuse for the belligerents to do further harm and reduce the space for compromise and moderation. India’s government supported UN Security Council resolutions that sought to restore the status quo without demonizing any party or proposing measures that would prolong or expand the war. It thus supported Security Council Resolutions 82 and 83 of June 1950. However, India showed no such support towards General Assembly Resolution 376 V of October 1950, which aimed at unifying the two Koreas instead of stopping the fighting. This, from the Indian perspective, was a dangerous change in the objectives of the UN, whose agenda was being shaped to a great degree by the United States. India also took a serious view of the General Assembly Resolution of February 1951, which clearly identified China as a party to the aggression on the peninsula. India believed that any finger pointing and name calling, especially targeted at China, would lead the Chinese to become aggressive, rigid, and a cause for great worry. The lesser the provocation, the better the prospects for peace. India’s second imperative was upholding the principle of great power unity. To that end, it believed that the Security Council had to create the space for all five great powers to deliberate and work together. Owing to the non-representation of the People’s Republic of China (PRC) at the Security Council, and the boycotting of this body by the Soviet Union as a mark of protest over Beijing’s exclusion, India appealed for the PRC be included in the Security Council and called for the body to jointly resolve the problem. Another powerful reminder of India’s commitment to great powers working collectively is to be seen in its opposition to the “Uniting for Peace” Resolution that was adopted by the UN General Assembly in November 1950. With the Soviet Union intent on blocking proposals critical of the PRC in the Security Council and thus exercising its veto option, the United States sought to outmaneuver the USSR by bringing these contentious issues to the General Assembly and using its clout to get resolutions passed that would further its objectives. By doing so, the Security Council – the seat of great powers – was undermined. Whatever little scope that existed for the great powers to argue and reach a settlement would be undermined via this mechanism. As a result, it was roundly criticized by India. With hostilities reducing from 1951 onward, the need was felt to end the war. However, the issue of repatriation of prisoners of war (POWs) became a stumbling block. While the UN favored “non-forcible repatriation,” where the POWs were to be given a choice about returning to their countries, the communists favored an “all for all” formula where POWs would be repatriated to their countries, willingly or not. Given the strong feelings on each side about this, and the potential for this disagreement to create problems and reignite hostilities, India was made chair of the five-nation Neutral Nations Repatriation Commission (NNRC). It was established following the Armistice Agreement in 1953 and looked into the fate of 20,000 POWs and their repatriation. India’s conduct and commitment in this capacity drew appreciation from many quarters. Most accounts of India’s role in the Korean War focus on these issues, typically through the lens of “high politics,” so that the human dimension is difficult to locate. Indeed, India’s link with the Koreas was forged through the institutions of diplomacy and its armed forces, as mentioned earlier. However, what makes the location of the proposed Korean War Memorial — Delhi — special is that some 80 to 90 POWs whose repatriation could not be worked out in Korea were brought to Delhi once the NNRC ceased existing in 1954. What became of them in Delhi once the dust of the Korean War settled adds a very human dimension to this episode and enhances the salience of the memorial as a symbol of the sacrifices made and the links forged. An insightful account of the fate of these POWs was provided by a former Indian foreign secretary (1976-79), Jagat S. Mehta, in his book The Tryst Betrayed: Reflections on Diplomacy and Development. Upon becoming deputy secretary (east) of the Ministry of External Affairs (MEA) in 1956, Mehta realized that about 90 POWs had been in Delhi since 1954 and that they had largely been forgotten by the government. Mehta noted that upon reopening the files related to the POWs, the latter were given the choice of migrating to another country or staying on in India. While many opted to go to Brazil, nine stayed on in India. One became a watch repairer; another a photographer. Both were provided assistance by the government to pursue their vocations. Mehta, however, struck up a close friendship with Nwang Ji or “Peter.” Mehta helped Peter in opening a chicken farm in the Okhla area of Delhi on a piece of land that belonged to a church. Funds for buying the requisite material to operate the farm were also provided to Peter. Such was the quality of eggs and chicken at Peter’s farm that diplomatic vehicles paid him regular visits to buy his products. With the money that he made from the chicken farm, Peter turned his attention to the south of India, where he collected widows’ hair that had been shaved to meet their religious obligations. The hair was graded and classified and exported to South Korea, where it was made into wigs for export to the United States. Thereafter, Peter embarked on a garment business, and also started an employment business for people interested in working in Saudi Arabia and the Gulf states. So successful did he become that he bought a house in Friends Colony, one of the most upmarket localities of Delhi. Once the Korean War Memorial is installed in Delhi, one hopes that it reminds all who see it not only of issues of “high politics” and statesmanship but also of the lives that were affected and altered in so many different ways. Let the memorial symbolize not only the sacrifices that humans are capable of making for their nations but also the indomitable spirit that inheres in us, which sees people like Peter pick themselves up, carry on with their lives, and even find success, however one may define the term. Nabarun Roy is Assistant Professor at the Department of International Relations, Faculty of Social Sciences, South Asian University in New Delhi.